You read that right. 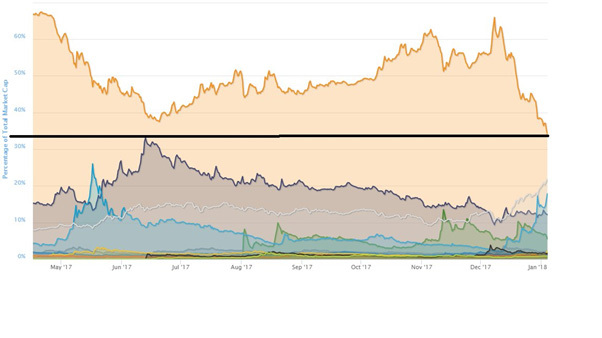 BTC’s market dominance has for the first time ever, dropped to a level, to which an alt-coin once had. 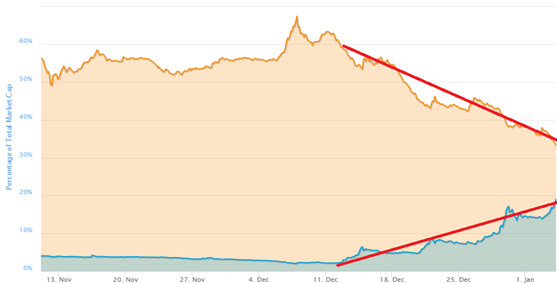 Unless something significantly changes, Bitcoin’s market cap will continue to fall against all alt coins. Ripple is already well over 50% of BTC’s own market cap in value, reaching a stunning $147 billion cap, and sits in second place, well ahead of Ethereum now. At this rate, there is not much difference between BTC and Ripple, and a flippening is actually not that far off, should BTC continue to tumble downward in price. Interestingly, Ripple’s success, directly correlates to BTC’s failure here. Quite literally, the moment BTC began its descent, was the moment Ripple began its steep climb. Also worthy of mention is that Bitcoin’s moment of descent correlates with the moment fees began to hit absurdly excessive figures ranging from $20 USD and upwards. It reaffirms, that if you decrease utility, you will also decrease value. Bitcoin’s utility with its rising fees, has been decreasing more and more, as users look elsewhere. Roger Ver in particular has been loud in voicing this one particular concern over time: that the full blocks are directly responsible for Bitcoin’s lost market share. It’s true that correlation does not always equal causation, but when you have an abundance of indicators, it’s unwise not to pay attention. This isn’t just a “fee” problem. This is probably even more so, a usability issue. Disgruntled users were forced to wait, days and weeks, until their transactions would confirm. The network is so heavily congested it is unusable in its current state. The fear and panic among users who found their transactions stuck, has caused an exodus. Ironically, it appears most users have found refuge in Ripple. Whether this refuge is temporary or long-term remains to be seen. But I am most certain, that Ripple’s success, and although the company has scored some recent deals with some major Asian banks, it can be more attributed to BTC’s own failings.